I went to Hong Kong for an annual eating spree recently and came back with some Dried Shrimp Roe. Dried Shrimp Roe is a Chinese condiment made by salt-curing the eggs of prawns before they hatch. I suppose they are considered a semi-delicacy in Hong Kong and they impart a salty umami-rich seafood flavour to whatever food they are sprinkled on. The Dried Shrimp Roe can last quite a long time as long as you keep them refrigerated. They are also not very expensive. The dried Shrimp Roe can be used as a condiment in wonton noodles, either they are mixed into the noodle dough before the noodles are dried and release their taste when the noodles are boiled or simply sprinkled or scattered on the cooked noodles. They are also sometimes cooked with bean curd or vegetables. ‘Ha-Zi’ is Dried shrimp Roe in Cantonese. It is like Bottarga which is a salt-cured fish roe from Sardinia or Karasumi, the Japanese version of Bottarga. For this Dried Shrimp Roe, all you need to do is to dry fry any amount in a pan until you can smell the fragrance and they are ready to use. Some of my friends have requested for this dish to be put on the blog when I posted a picture of my home made wonton noodle on the facebook. I hesitated to write about this, not because I do not want to share the recipe. We simply cannot buy any dried shrimp roe in Singapore. I have tried looking for it in some of the dried sea food wholesale shops but to no avail. The people there have not even heard of it. So, when my good friend, S told me she was going to Hong Kong, I jumped at the chance to ask her to get some more for me. She was so sweet to hunt them down for me. Thank you my dear friend S.
I plan to put some on pasta the next round and I think it might just work. Dry fry shrimp roe till fragrant and set aside. Add in cut prawns and mix. set aside. Fry the cut shallots in the oil till it is lightly browned. Separate the shallots and the oil. The shallots are to top the noodles and the oil is for mixing with the noodles. Boil a big pot of water for cooking the noodles. Get ready a big basin of cold water for dunking in the cooked noodles. While the water is boiling, put 1 or 2 tsp of meat mixture onto the wonton skins to make wontons. Take out 6 serving plates and on each plate put in 3/4 tbsp of oyster sauce, 1 tbsp of shallot oil and dashes of pepper. Use a spoon to mix well. Scald the vegetables when the big pot of water is ready. Dish up the vegetables and set aside. Now cook the wontons, when the wontons float up, it is an indication that it is cooked. If you find it time consuming, cook it in another small pot on another flame simultaneously with the vegetables. In the same pot of boiling water after cooking the vegetables, cook the 1 round of noodles at a time. The noodles need to be cooked for just 1 minute or to your liking of doneness. I like mine with some bite. When the noodles are cooked, dunk it in the basin of cold water for a few seconds to stop it from cooking. Then put it back into the pot of boiling water to heat up for 1 to 2 seconds. Drain thoroughly and immediately put it in the plate of mixed oyster sauce and oil mixture and using a pair of chopsticks or tongs to mix the sauce well with the noodles. 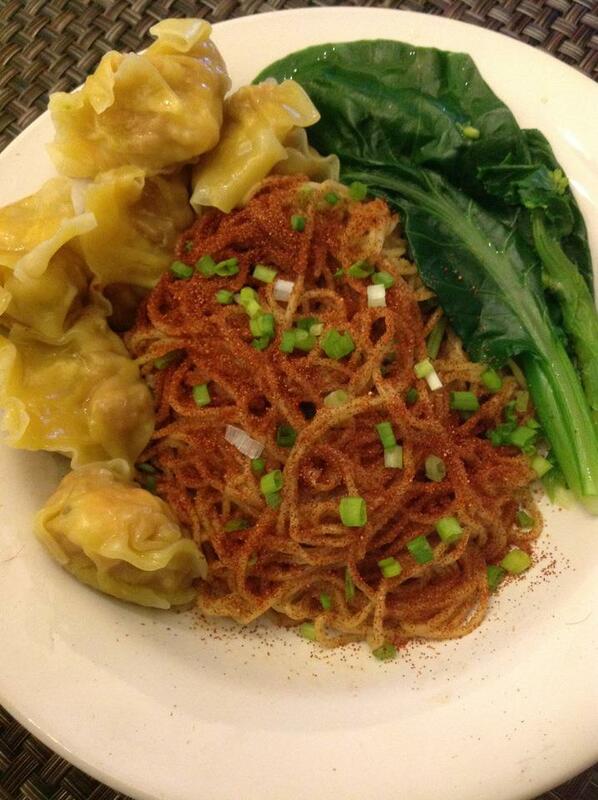 Put 5 to 6 cooked wontons and some vegetables on the side of the noodles on each plate, sprinkle 1 tsp of prepared Dried Shrimp Roe all round on the noodles and topped with some fried shallots. Do likewise for each plate and serve noodles with a small bowl of prawn flavoured soup. 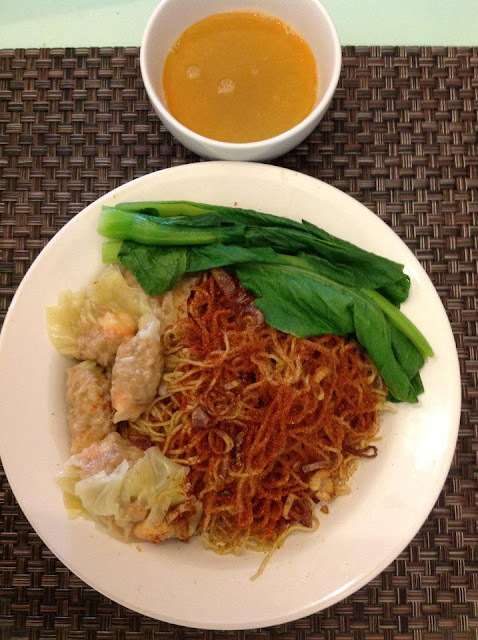 Not many places in Singapore sell this kind of noodles. "Changed the status, feeling very loosen "
Today is the day that gymnastics of Asia Game man surpasses a training, the training that surpass a stage is the gets used to formal race site exclusively opportunity before contest, because this equipment suffers,take seriously. 20 when make, yang Wei appears suddenly on the step of banquet of honored guest of gymnastic house bleachers, reporter collect went up to undertake be interviewinged briefly to its. "Changed a kind of part this, changed a kind of identity to participate in inferior carry, feeling very loosen, without the nervous move that becomes an athlete. " he is laughing to say: "After retiring these two years, was to marry first, had a son next, became for some time ' domestic Fu male ' , photograph is in the home " Fu " godchild, cry by present popular saying ' the husband that boil ' . Cry by present popular saying ' the husband that boil ' ..
"Grab the rice bowl that grabs you first "
After the famous general retires, many gymnastics chose to do a coach, of the Fu Tianyang that includes Japanese group among them. Yang Wei discloses, him think of a way that makes a coach ever also had had, "But I still think first many sided understands gymnastics, because this pursues the matter related to gymnastics later to me,meet more helpful. Do hookup this to make me deep experience hookup for instance the team with how giant need of a competition, much more complex link. A lot of things need to precipitate first, and rather than makes a decision very actuationly. I think the job henceforth should not break away from gymnastics, dry still capital goes. Should follow you to grab at present nevertheless grab rice bowl, ha. Ha..
"He can call father early "
Accept a reporter to interview this or that very moment, yang Wei received a telephone call, open a mobile phone, the reporter discovers the mobile phone protects screen is the son's lovely big head is illuminated. No matter what do, yang Wei won't forget father this identity. "He can call father early! " speak of firm full son of 1 year old, yang Wei one face is proud. But go to school to whether will also sending the child henceforth gymnastic road, yang Wei's answer is very careful: "Had not considered now so far. "Had not considered now so far..
"Win victory without battle is the view of media only "
Because Japanese team sent second line troop only, a lot of people think gymnastic team of China of current Asia Game is probable big package is pulled greatly, and " win victory without battle " . Yang Wei refutes: "Big package takes the view that is media only greatly, chinese gymnastic team does not put a word before contest, besides topaz Bin directive Beijing Olympic Games has said not to take organization championship to jump building. Gymnastic team is to rely on achievement conversation, specific how much take or let our wait and see what happens. I also believe they are met hammer and tongs. I also believe they are met hammer and tongs.. Since Yang Wei [url=http://www.stmarysmumbai.com/jordansforsale.aspx]cheap kids nike shoes[/url] after retiring, chinese man gymnastics is short of to get military thing from beginning to end, little one " all-pervasive king " . To this, yang Wei expresses: "A Yang Wei comes out immediately after we cannot ask Chinese team retires in me, give again ' all-pervasive king ' , all-pervasive project is need long of harden oneself, I can give achievement to experience the harden oneself of a long time, our need gives them time. "